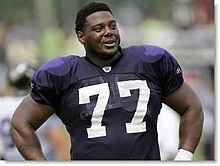 Not to be confused with Orlando Brown Jr..
Orlando Claude Brown (December 12, 1970 – September 23, 2011) was an American football player who played offensive tackle in the NFL for the Baltimore Ravens and Cleveland Browns. He attended Howard D. Woodson High School. He played college football for Willie Jeffries at South Carolina State University. He was nicknamed "Zeus". Orlando Brown was born in 1970 in Washington, D.C. Brown attended H. D. Woodson Senior High School. He went to South Carolina State University and played offensive tackle. Orlando Brown signed with the Cleveland Browns as an undrafted free agent in 1993. He spent three seasons with the Browns. In 1996, the Browns franchise was moved by owner Art Modell to Baltimore, becoming the Baltimore Ravens. In his first stint as a Raven, Brown who, at 6-foot-7, 360 pounds, was known as an energetic and intimidating player, earned the nickname "Zeus". In his prime he was one of the highest-paid offensive linemen in the NFL. Brown was signed as an unrestricted free agent by the "reactivated" Cleveland Browns before the 1999 season. During a December 19, 1999 game against the Jacksonville Jaguars, Brown was accidentally hit in the right eye by a penalty flag weighted with ball bearings thrown by referee Jeff Triplette. Triplette immediately apologized to Brown. Brown left the game temporarily, then returned to the field only to shove Triplette, knocking him to the ground. Brown was ejected from the game and had to be escorted off the field by his teammates. Brown was subsequently suspended by the NFL, but the suspension was lifted when the severity of his injury became apparent. Brown missed three seasons due to temporary blindness. Brown was one of only two players to have played for the original Cleveland Browns and the Browns after the team was revived in 1999, as most of the Browns roster was moved to Baltimore. The other player is Antonio Langham. Brown sat out the entire 2000 NFL season waiting for his right eye to heal. The Browns released him after the season. In 2001, he sued the NFL for $200 million in damages. According to reports, he settled for a sum between $15 million and $25 million in 2002. Brown spent the 2001 and 2002 seasons in rehabilitation before he was picked back up by the Ravens in 2003. During the 2003 season, Brown started at both offensive and defensive tackle in a game against the Oakland Raiders. He remained with the team until being released in March 2006. Following his retirement, Brown retained ties with the Ravens and mentored players. After retiring from football, Brown went into the restaurant business, and became the owner of the first Fatburger franchise in Maryland. In September 2009, Brown was arrested and charged with third-degree burglary and destruction of property. The charges were later dropped. Brown was found dead on September 23, 2011, in his Baltimore townhouse. The state medical examiner ruled that Brown died of diabetic ketoacidosis, an ailment common among diabetics and caused by high blood sugar and lack of insulin. He is survived by three sons: Orlando Brown Jr., Justin, and Braxton; and two daughters: Tanisha and India. Orlando Brown Jr. played for the Oklahoma Sooners from 2014–2017, and was drafted by the Ravens in the third round of the 2018 NFL Draft. ^ "Orlando Brown Stats, News, Photos". ESPN.com. Retrieved May 1, 2010. ^ a b c d e f Slotnik, Daniel E. (23 September 2011). "Orlando Brown, Who Sued N.F.L. Over Errant Flag, Dies at 40". The New York Times. Retrieved 24 September 2011. ^ "TRANSACTIONS". nytimes.com. March 17, 2006. Retrieved February 20, 2018. ^ "Fog Cutter Capital Group, Inc.'s Fatburger Unit Opens First Maryland Restaurant with Former NFL Player Orlando Brown" (Press release). Fatburger. January 12, 2009. Archived from the original on April 11, 2010. Retrieved May 1, 2010. ^ "Orlando Brown arrested, charged twice". ESPN. September 4, 2009. Retrieved September 4, 2010. ^ "Charges dismissed against Orlando Brown". Scout.com. January 9, 2010. Retrieved December 27, 2010. ^ "Ex-Ravens tackle Orlando Brown dies". ESPN.com. September 23, 2011. Retrieved September 23, 2011. ^ "Medical examiner: Orlando Brown died of diabetes complications". October 3, 2011. Retrieved October 3, 2011. ^ Wesseling, Chris. "Orlando Brown drafted in third round by Ravens". NFL.com. Retrieved 28 April 2018. Players of American football from Washington, D.C. This page was last edited on 27 September 2018, at 12:46 (UTC).